Soundproofing your house, might look like a great idea for your dog this Fourth Of July Holiday week. With fireworks laws being ignored coast to coast this week, animals need quiet. I can’t help them, but if you live in the city and like movies or music, I might be able to help you. Let’s talk isolation. I am not talking about “me” time at home, and I know isolation isn’t something we normally think of as pleasant. But when it comes to home theater, recording rooms or even game rooms isolation can make all the difference in the world. Thinking about being isolated in a game room might sound a bit odd, but what I am talking about is sound isolation. Something most people call “sound proofing”. Has anyone ever told you to “turn it down” or “quiet down”? Sound Isolation can help. I say sound isolation because even the best at Acoustiblok will tell you soundproofing doesn’t really exist. One of the great tricks I learned as a Home Theater Designer is that high end builders insulate interior walls. It makes the house quieter and gives it a more solid “feel”. As much as we all want to think we are savvy home buyers, I can assure you even I fall for the quiet house trick. Regular in wall insulation won’t do much either. The minimum is something like “Quietzone” by Owens-Corning. 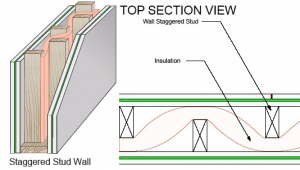 It is a specifically made in wall acoustic insulation, but there is a better way, actually a much better way to approach isolation. Any homeowner that wants to keep sound from traveling room to room will need quite a bit more than just a little in wall insulation. Recently we finished a project where there was a recording studio above a garage and next to a guest bathroom. An additional challenge was the door and window that led outside. More on what we did there later. Sometimes called “rock wool” insulation, mineral wool insulation was used. Mineral wool has a density similar to wool, but it is spun from rock and slag. Roxul three inch mineral wool insulation was used throughout the project, in the areas that didn’t touch the studio. In the walls, floors and ceiling around the recording studio, QuietFiber as part of the Acoustiblok sound isolation system was used. QuietFiber has nearly twice the density of Roxul and QuietFiber comes on easy to install prefaced sheets. Everyone that walks into the project talks about the “quality feel”, not realizing it is simply quieter. To really get into sound isolation, there is a lot more than just insulation. Instea d of 2×4 walls between rooms, we spec’d 2×6 wall frames with 2×4 staggered studs between them. This helped to decouple the adjoining rooms. We then split the 6” thick Quietfiber and filled the stud bays from both sides. For the exterior walls the standard 2×6 studs were used with QuietFiber insulation. The next layer for three of the walls was Acoustiblok’s namesake product, you guessed it, Acoustiblok. Unlike other mass loaded vinyl barriers or MLV’s, Acoustiblok is UL listed for construction installation, and doesn’t have any hazardous materials infused to add weight. Even then it is still one pound per square foot. For the last wall, an RC-1 channel was added and then Acoustiblok. After all of this was done, 5/8 fire rated sheetrock was installed with a 1/4 to1/2 inch . gap between the wall and ceiling rock. Tight fits aren’t wanted here. The gaps are filled with isolation caulk called acoustic sealant for flexibility. Even after the sheetrock was hung, there was still sound leaking in. A dripping faucet isn’t as loud as a faucet running full stream, but there is still noise. Every outlet and light box was like a dripping faucet letting sound in. Following the Acoustiblok program, we used PuttyPads to wrap all of the electrical outlets, light fixture boxes, and even the smoke alarm box. Then we used Acoustic Sealant to fill all of the gaps around the same boxes and the gaps between the sheetrock and the floor, the ceiling and the corners. The AC ducts were sealed and had three 90 degree bends inserted to reduce sound traveling down the ducts. Yes we built a nearly airtight room. In fact we added a “jump duct” to relieve pressure when the AC kicks on. The jump duct goes to the master closet so that when the studio door is closed air can still leave the room. We ducted to the master closet since it is normally one of the quieter spots in the house, and where the actor used to record her voice work. I am sure you are wondering if all that work was worth it. Well, there is still more! At this point the recording studio had a 39 db floor, nearly identical to the bedroom next door. Without wall treatments this is expected. While the sandblasters were etching the stucco on the old section of the house, the measurements got very different. Outside the reading was 111 db. Inside the office, standard insulation from previous construction, 94db. The new construction bedroom with mineral wool insulation was 89 db, 5db better than the original section of the house. In the sound room it was a tolerable but not recordable 68 db. That is a massive 31db drop from the 89db right next door. When you understand the db is a log scale, you realize how much energy the room is rejecting or absorbing. Again this isn’t soundproofing and getting to far below 30db and you get a “dead room”. A dead room is really an anechoic chamber which is good for testing speakers and that is about it. The interesting thing to keep in mind is that the more sound you keep out, the more you keep in. Many times we read the untreated bedroom at 2db lower than the sound room. While that may not sound like much, that is a lot of energy leaking out of the untreated room that needed to be handled in the treated room. This was always with no outside noise of course. Keeping in mind the recording studio has a double pane window and a french door that lead outside we knew there would be a problem. Using a highly directional sound mike, we discovered huge spikes while looking at the door and window every time the wind blew. The final step was to build 4” thick barn doors that cover the French Doors. The frames were filled with mineral wool, and the exterior facing portion was covered with printed fabric using photos taken by the artist. You can buy panels like this on her website. They can print photos on cotton or blend fabric and build them over mineral wool. Way way cool stuff and much better looking than that egg crate foam. By using fabric on the exposed side, any sound that leaked in through the door was trapped in the mineral wool. Another option suggested by R.Bob Adams at Dolby SLS was to use a 26lb/yard felt and make acoustic curtains with a 100% fold. This means it isn’t pulled straight and you need at least twice as wide a curtain as the area you are covering. You will also need about eight inches of overlap at the ends of the door. A smaller version of that barn door was build to cover the window. Before these panels were installed the sandblasters were gone, but we met our goal. We wanted a maximum floor of 30db even when cars went by or a plane flew over. Since the basic room had a 39db floor due to its own noise, we treated it before measuring again. Once we got the floor down to 30 db, we then compared it again to the room next door. This time it was a very different result. At the end the bedroom had a 39 db floor with 76 db peaks when aircraft or loud vehicles went by. The studio never broke 32 db regardless of what flew or drove by. That is the isolation the artist needed to work from home. Since completing the room, the builder has sent customers my way for acoustic advice. The most recent was a guy whose “home theater” is directly underneath the master bedroom. He wanted soundproofing for his bedroom. For aesthetic reasons, the installers put ceiling speakers in. You can imagine what it is like in the bedroom with the speakers right underneath the carpet. Using a similar technique, I drew up a box to build around the speakers and re-install them in the ceilings. Isolation is a little art, a little science and when it is used in the right places, everyone is happier. You can see a complete video of the project that includes more isolation insights from expert Sean Saathoff on KuhlToys.com. Scott Bourquin is a former THX level Two and Cedia Certified home theater installer and the host of KuhlToys. Next Topic: Best Breakfast in Hawaii – At McDonalds?